SUNNY BUT COLD: We are starting the day with sub-freezing temperatures over most of Alabama; the sky will be sunny today with a high in the 40s for the northern half of the state, with 50s to the south. Another freeze is likely early tomorrow with most communities dropping into the 20s. The sky will stay mostly sunny tomorrow, but clouds roll in quickly Friday, and some rain will likely push into the state Friday night ahead of a surface low forming over the western Gulf Coast region. Highs tomorrow and Friday will be in the 48-52 degree range. WET WEEKEND: We are still forecasting a cold, soaking rain for all of Alabama Saturday as the surface low moves along the Gulf Coast. No severe weather worries in a cold, stable airmass, just lots of rain. The weather won’t be much better Sunday; it will be another cloudy and cold day with periods of light rain and drizzle. 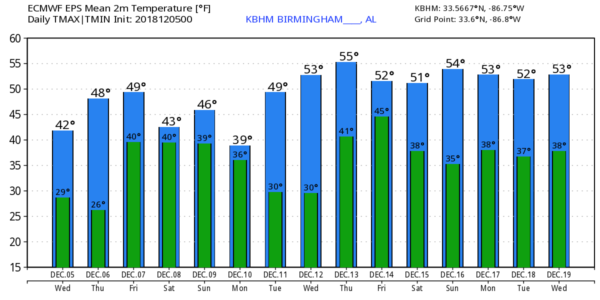 Temperatures will hold in the 40s both days over North Alabama, with 50s for the southern part of the state. Rain amounts of 1-3″ are likely statewide; it should be a good soaking for all 67 counties. SUNDAY NIGHT/MONDAY: As the surface low moves east of the region, and colder air is pulled southward, there is a chance of a few snow flurries Sunday night or Monday morning over Northeast Alabama. Thermal/moisture profiles for now suggest this will be a no-impact situation… otherwise Monday will be mostly cloudy and cold with a high only in the 38-44 degree range. 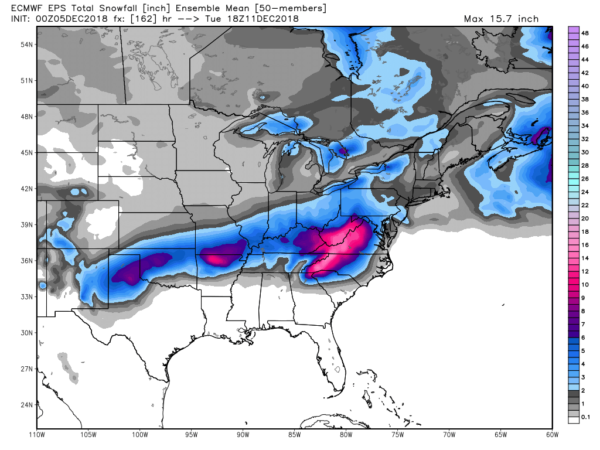 Best chance of accumulating snow with the weekend storm system will remain well to the north of Alabama, over parts of northern Arkansas, far northern Tennessee, and Kentucky. REST OF NEXT WEEK: Tuesday and Wednesday look dry with a slow warming trend, then rain returns to the state late Thursday and Thursday night. See the Weather Xtreme video for maps, graphics, and more details. ON THIS DATE IN 1998: The weather was unseasonably warm across much of Alabama; Birmingham soared to 79 degrees for a new daily record high. Montgomery reported a high of 83.